Oh, by the way, when you use the Brilliance ink be sure to heat it with your heat gun to dry it or it will smear, it kind of does a little mini embossing all on its own when heated. Supplies: 4" X 4" Easel card, Papers: Best Occasions textured card stock, DCWV The Christmas Stack from last year, Stampin Up: Whisper White, Wausau Metallic silver card stock, Stamps: Stampin Up: Sweet Centers, Inkadinkado 97734 Warm Holiday Wishes, CTMH: D1283 Say It in Style, Ink: Brilliance: Platinum Planet, VersaMark Ink pad, Stampin Up: Not Quite Navy, CTMH: silver embossing powder, Stampin Up: 1 3/4" cirle punch, Stampin Up: Sweet Treat Cups, glittered a white snowflake brad, The Paper Studio Spare Parts: tiny heart brads, pop dots. 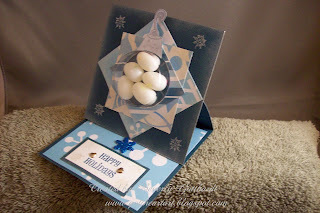 love these easel cards you are doing and the treat cups work out great with these cards; this is super cute! Oh, great idea to use the Stamping 411 sketch as an easel card! Love it! Thanks for playing along, even though you missed the cutoff time. 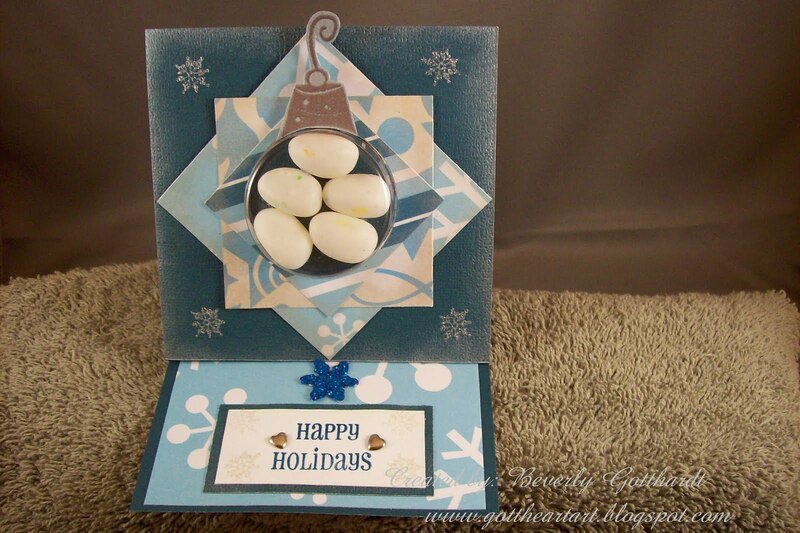 Yep, I am going to have to give those easel cards a try one of these days! Thanks for sharing your No Red/Green card with us this week on 3 Clovers Thursday challenge!! !